When any of the garage door parts is malfunctioning, seriously damaged or completely broken, you have to take timely measures to fix the problem and protect your property and family. The best measure which you can take is calling Garage Door Repair Amityville. We have the knowledge, skills and expertise to resolve any issue timely and in a cost-efficient way. 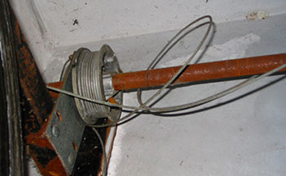 Our repair service is of top quality and is readily available in emergency situations. We are here to respond to your calls for urgent help, 24 hours a day 7 days a week. We will be at your place in no time and before you know it, you will have a door which is operating safely and effectively. 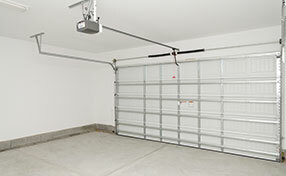 It is not surprising that we are a leading garage door contractor in the area. We have everything necessary to fix any problem with any type of door. We are experts not only in traditionally used systems, but in more rarely found ones such as residential roll up garage doors. We handle openers from all brands without exception. We are well familiar with all models including the very old and the newest ones. 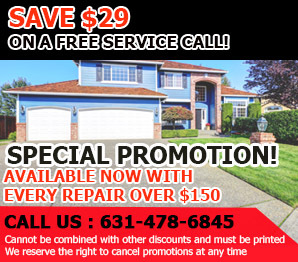 We, at "Garage Door Repair Amityville", have made our repair service perfectly comprehensive. It ranges from broken spring replacement to full motor repair. We perform all kinds of small tasks such as aligning rails. We take care of the most serious issues such as decaying wood panels. We don't only fix the parts connected to the door, but all types of remote controls as well. Whenever you decide that it is time to replace your old garage door opener, you can rely on us to complete the job quickly and professionally. We provide panel replacement as well. If modifications have to be made, we are here to help. Like us on Facebook to access detailed information and the most attractive offers.